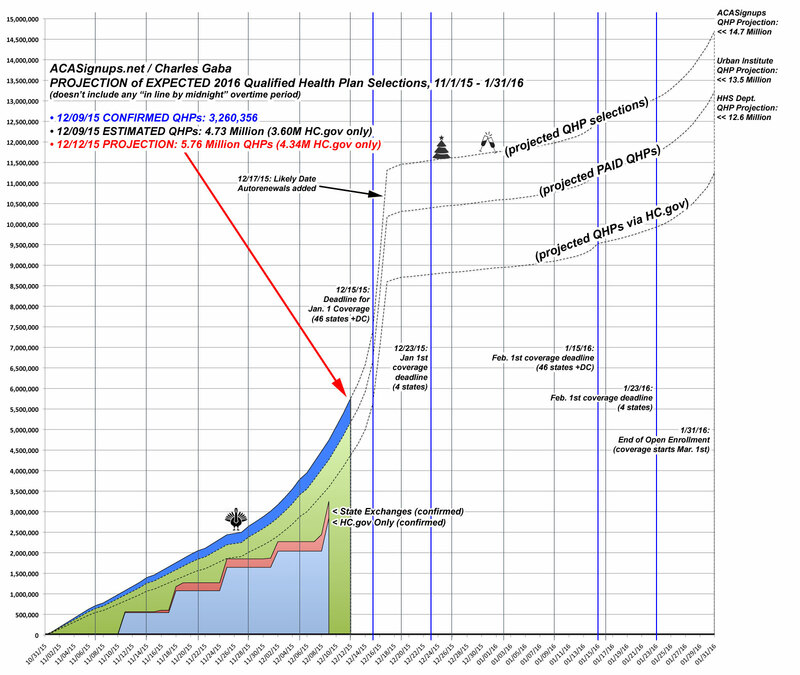 Home » Blogs » Charles Gaba's blog » In 2013, it took 2.5 months to enroll 800,000 people. This year, 800K may have enrolled yesterday ALONE. Remember, currently, The Graph is modeled on the assumtion that there will be something like 3-4 million auto-renewals being bulk-added to the national tally over the next two days. It's possible that, say, 80% or so of this week's spike will end up being those same 3-4 million people actively renewing/re-enrolling for next year. If so, the Friday total, which I'm currently assuming will be roughly 11.3 million or so nationally, could end up being...pretty much exactly that. If that happens, then the second half of the open enrollment period will likely play out pretty closely to how I already expected it to. HOWEVER, if a large percentage of this week's spike (50%+?) turns out to be new enrollees being added to the tally, then there will still be several million current enrollees who will be auto-renewed. If that's the case, then the total going into this weekend could end up topping 12 million or even higher...which would eclipse last year's total Open Enrollment tally of 11.7 million with 6 weeks still left to go. Even then, however, it's not guaranteed that the final January 31st total will be higher than my 14.7 million projection; it could simply be that the last six weeks end up being relatively flat, with a less-impressive spike in the final days of January, still leading to around the same total anyway.